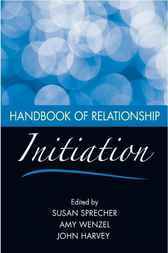 The Handbook of Relationship Initiation is the first volume to focus specifically on the very beginning stage of relationships – their origin. In this Handbook, leading scholars on relationships review the literature on various processes related to the initiation of relationships: how people meet, communicate for the first time, and begin to define themselves as being in a relationship. Topics include attraction, mate selection, influence of social networks on relationship initiation, initiation over the internet, hook-ups among young adults, and flirting and opening gambits. In addition, the dark side of relationship initiation is considered, including unwanted relationship pursuit and barriers to relationship initiation including social anxiety. This volume provides an overdue synthesis of the literature on this topic. It is especially timely in view of the growing prevalence on relationship initiation online, through matchmaking and other social networking sites, which has increased awareness that science can be used to understand, create, and facilitate compatible matching. This Handbook provides an essential resource for an interdisciplinary range of researchers and students who study relationships, including social psychologists, communication scientists and scholars of marriage and the family.